There is nothing more daunting for an engaged couple than choosing their wedding menu. With many people to serve and many different tastes, getting the menu just right can be nothing short of a challenge. There are some foods that you might not want to serve at your wedding. What are they and why? Read on! Shrimp cocktail. So many couples think that serving shrimp cocktail brings a level of elegance to their wedding. It can, if it is done well. Overcooked shrimp is mealy in texture – not something you want your guests to remember. Before you add this to your menu, be sure your Akron caterer will purchase high quality shrimp and cook them correctly. Anything raw. Raw bars and sushi can make your wedding really special. Unfortunately, when raw foods are served they have to be handled carefully to make sure they are safe for your guests. Concerned? Leave them off of your menu. Cheese and crackers. Run-of-the-mill cheese cubes and crackers are just not that special. If you do want to serve cheese, consider an artisanal cheese tasting board with varieties that are local to your area. Frozen vegetables. Mushy and soggy, a frozen vegetable medley is just not a good choice. Professional caterers in the Cleveland area suggest a crisp salad or grilled, marinated seasonal vegetables instead. Pasta on a buffet. Baked pasta can be a delicious meal, but not when it has been sitting on a steam table. Avoid the large pasta dishes on the buffet and opt for a pasta bar which will taste much more fresh and delicious. 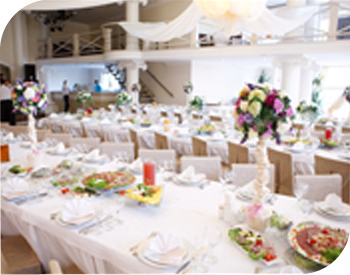 Some of the go-to foods for weddings will simply not do anything for your event. Poorly cooked shrimp cocktail, cheese cubes and a resusciated frozen vegetable medley are not the best choices. Call Special Moments Catering today for delighftul options!